At the 1876 Philadelphia Centennial Exposition, two recent American inventions were placed on public display for the first time. One, a certain voice-transmission apparatus invented by a man named Alexander Graham Bell attracted widespread attention among the fairgoers. The second, called the typewriter, attracted almost none. Yet by the time of the American Bicentennial Celebration, the typewriter had become such an integral part of American life that it’s hard to imagine how business was carried on without it, just 100 years ago. The first recorded attempt to invent a typewriter actually took place in 1714, when an Englishman named Henry Mill filed a patent for what he rather longwindedly described as “An Artificial Machine or Method for the Impressing or Transcribing of Letters, Singly or Progressively one after another, as in Writing, whereby all Writing whatsoever may be Engrossed in Paper or Parchment so Neat and Exact as not to be distinguished from Print.” If Mr. Mill was as verbose as this description suggests, it’s no wonder he saw the advantages of a typewriting machine. In any case, Mill’s typewriter was apparently never constructed, and no drawings of his project were ever found. The earliest typewriting machines in America were crude attempts to mechanize the printing of Braille so that the blind could write as well as read. A machine called the “typographer,” capable of printing ordinary letters, was patented in 1829. The type was set on a semicircular frame that had to be turned by hand, so that only one letter at a time could be shifted into position and printed. Needless to say, the machine was much slower than writing, as were most early typewriters. And many typewriting machines were as large as a piano, with keyboards resembling black and white ivories! In the 1860’s, two Milwaukee inventors were busy developing a machine for consecutively numbering the pages of a book. One of the men, Carlos Glidden, came across an article describing a new British machine capable of printing typed letters, and he brought the article to the attention of his partner, Christopher Latham Sholes. If our machine could print page numbers, Sholes wondered, why couldn’t it also print regular letters? By 1867, Sholes had constructed the first practical typewriter in his Milwaukee shop. Sholes’s first typewriter was a cumbersome machine with a piano keyboard, little improvement over other models then in existence. But in 1868, Sholes and Glidden turned out a second model, the first typewriter capable of printing faster than the pen. Sholes’s major innovation was an arrangement of keys that allowed two letters to be typed in rapid succession. With other early models, the typist had to wait until the type bar of the first letter had returned to the carriage before striking the second key, or risk locking the two bars together and bringing the machine to a halt. Thus, Sholes’s keyboard, identical to today’s except in minor details, was designed so that letters that combine frequently in our language would be separated on the keyboard-hardly the ideal arrangement for the typist, as proponents of the new Dvorak keyboard point out. In 1873, Sholes signed a contract for the manufacture of his machine with E. Remington and Sons, gunsmiths of Ilion, New York, and the following year, the first model, called the “Remington,” was placed on the market. You may imagine that the first Remingtons were scooped up by clever businessmen as fast as they could be manufactured. Not true. Most businessmen couldn’t see the advantage of a machine only slightly faster than handwriting that cost, in the words of one, “a thousand times as much as a pen.” As late as 1881, Remington was selling only 1,200 machines a year. 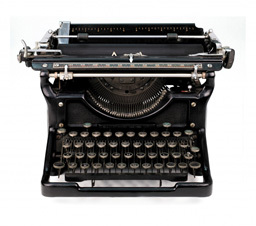 It took almost a decade after the first Remington was manufactured that typewriter sales began a steady climb upwards. One drawback of the early machines was their extremely slow speed. For one thing, upper and lower case letters were contained on separate keyboards, necessitating continual movement from one keyboard to the other; at the time, more words were capitalized than are today. It wasn’t until 1878 that the first machine with a double keyboard (upper and lower cases on the same keyboard, with a shift key) was placed on the market, but even then the two systems remained in competition until 1888. In that year, a typing contest was held in Cincinnati between a Mr. Traub, one of the leading exponents of the separate keyboard system, and a Mr. McGurrin, who’d taught himself touchtyping on a double keyboard machine. McGurrin won the speed contest easily, and the separate keyboard typewriter became a museum piece. Another drawback presented by early machines was the inability of the typist to view the paper until it was removed from the typewriter. In 1883, the first typewriter with visible printing was marketed, and Correcto-Type became a practical though distant reality. There were few inventions of the late nineteenth century that Thomas Edison didn’t at least dabble with, and the typewriter was no exception. In fact, Edison constructed the first electric typewriter, which printed letters on a moving roll of paper. Edison’s device eventually became the ticker-tape machine, with the first electric machine perfected by James Smathers in 1920. The first portable typewriter had been manufactured in 1909. In 1956, the two inventions came together to form the electric portable, the term-paper writer’s best friend. The IBM Corporation broke new ground in 1959 with the development of the Executive Electric, the first typewriter capable of line justification (the printing of lines flush with one another on the right side as well as the left) and differential spacing. In machines without differential spacing, letters as narrow as an “i” and as wide as an “m” are allotted the same amount of space on the page. With differential spacing, letters are allotted space in accordance with their width, making possible line justification and a much neater, print-like page. In 1961, IBM developed the first typewriter with a spherical type carrier, the “the type ball,” eliminating the nuisance of interlocking type bars. Today’s typewriters can print in almost any language including computer code. A New York linguist claims he can, in one hour, adapt a typewriter to print in any of 146 languages. There’s a Chinese typewriter called the Hoang with 5,850 characters on a keyboard two feet long and seventeen inches wide. Top speed on the Hoang is about ten words per minute. There’s also a musical notation typewriter capable of printing fifty different notes and symbols. And a shorthand typewriter-invented in 1910-that can record up to 200 words per minute. Modern versions of the latter are used today by court stenographers. If you’ve ever lived in an apartment next door to a budding writer, you might be pleased to learn that a noiseless typewriter was invented more than fifty years ago. The machine used heavier type bars that moved with lower velocity but carried the same momentum as regular bars. Alas, the model proved to be poor for producing carbon copies. If you’re a practitioner of the “hunt-and-peck” school of typing, you may be encouraged by the development of the Dvorak keyboard, patented in 1936. The Dvorak keyboard is arranged so that the letters most common in English are most easily and comfortably reached by the touch typist. The Dvorak keyboard looks much like the universal keyboard, with three rows of letter keys. But on the Dvorak, 70 percent of all letters in almost any given passage can be found on the middle row, with the most common letters placed under the strongest fingers. Proponents of the new system claim that the increased speed of the Dvorak method and the lessening of typist fatigue could result in a savings of $20 million a year in business expenses throughout the country. However, the machine is a costly investment, an Olympia typewriter with a Dvorak keyboard costs an extra $300 above the regular price. It is not surprising then that as of April 1978, Olympia has sold no Dvorak keyboard machines for two years. Candidates for typing instruction, both male and female, were chosen on the basis of physical strength rather than intelligence or dexterity, since operating the heavy keys of early typewriters was arduous work. The first author to submit a typewritten manuscript was Mark Twain. But there’s some disagreement as to which of Twain’s manuscripts earned the honor. In his Autobiography, Twain maintained that The Adventures of Tom Sawyer was the first book he typed. But in a letter to a friend, Twain claimed that the earlier Life on the Mississippi was also submitted in typescript. In any case, Twain bought his Remington for $125. Later, when he attempted to give the machine away, he found it extremely difficult to find a taker. In case you were wondering: Pope Pius X11 was the first pontiff to use the typewriter. He was an excellent touch typist. And George Bernard Shaw was the first playwright to use a typewriter as a stageprop, in Candida (1898). What’s the fastest typing speed ever recorded? The top speed ever achieved by a typist, 216 words per minute stands as the record, set by one Stella Pajunas in 1946 on an IBM electric. To give you an idea of her accomplishment, sixty words per minute is considered good professional speed. The record for top speed for over an hour of nonstop typing is 149 words per minute, also set on an IBM machine. Perhaps the most remarkable typing record is held by Albert Tangora, who during a 1923 business show in New York, ran off a total of 8,840 correctly spelled words in one hour of nonstop typing, a rate of 147 words per minute. Incredibly, Tangora achieved his record on a cumbersome old manual typewriter that would seem crude in comparison with modern models. Judges estimated that Tangora executed an average of twelve-and-a-half strokes per second! The Dvorak Simplified Keyboard, or DSK, attempts to combat the tyranny of QWERTY through a logical arrangement of keys. The DSK places the most frequently used letters (70%) on the middle line or “home row” of the typewriter. On the top line letters used 22 % of the time; on the bottom row, letters used only 8% of the time. The record for sustained speed on a Dvorak keyboard is 170 words per minute. The longest nonstop typing stint was 162 hours, one minute, set by California high school teacher Robin Heil in 1976. A blind English office worker named Mike Howell holds the duration record for a manual machine: 1201/4 hours. But the world’s greatest typing buff must certainly be Mrs. Marva Drew of Waterloo, Iowa. Over a six-year span, Marva exercised her skills by typing the numbers one to one million on a manual typewriter, a feat requiring 2,473 pages!